Please join us in wishing Marcy Bartlett a fond farewell. Marcy is leaving RT-AFF after six and a half years of service. Marcy will be joining her husband Steve in retirement as they downsize and move to a new community. Marcy has had a huge impact on RT-AFF. She joined our team in 2012, one year after we incorporated. She had just spent a year contemplating what she wanted to do next after taking an “early-out” as a Director at Lockheed Martin. We were incredibly fortunate that our email blast describing the new Program Manager position landed in her in-box just as she was ready to take on a new challenge! When she sent me her resume it was almost too good to be true that she was interested in our small but growing organization. Marcy had extensive experience managing large international contracts and an impressive portfolio of programs for Lockheed. 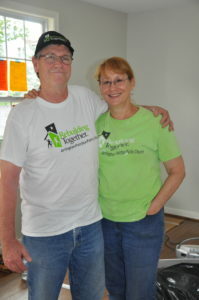 She had also been involved as a volunteer for Rebuilding Together as part of a faith community. She brought her husband Steve and son Rowland along for the ride as volunteers, making her time with RT-AFF a family affair. Marcy built important and close relationships with our teams, team leaders and volunteers. She helped our organization grow beyond National Rebuilding Day by focusing on our Handyman Corps and working with them to make year round repairs for many homeowners who didn’t fit into our traditional work model. She had a special affection for the Handyman Corps and got a lot of satisfaction from getting to know them and their spouses, learning from them and working with them on many homes. Her skills in project management and effective use of our limited resources allowed RT-AFF to serve more low income homeowners, increase our impact and engage more volunteers in our community. This included organizing and managing the largest and most challenging project that RT-AFF has ever completed. During Marcy’s tenure from 2012 – 2018 we achieved some remarkable results: RT-AFF worked on 490 homes with more than 9,500 volunteers who contributed 85,600 hours totaling more than $3.6 million dollars of donated labor making repairs and modifications for low-income homeowners in Arlington, Fairfax and Falls Church. Marcy is recognized across the RT national network as one of our leaders in Safe and Healthy Housing. She helped develop our repair specifications and standards for safe and healthy housing including the 25 priorities affiliates around the country now use to measure their effectiveness and impact. We are a stronger organization locally and nationally thanks to Marcy’s contributions. Marcy’s impact goes beyond the homes we’ve repaired and the homeowners she has touched. She mentored many volunteers and helped them grow individually and as members of repair teams. She mentored two AmeriCorps members who served our affiliate. Marcy took great pride in watching them grow in their professional and personal lives both during their service with us and after they moved on in their careers. This summer she planned and executed two complex rebuilds with the Rebuilding Together National cohort of 33 AmeriCorps members who had their first exposure to Rebuilding Together’s work under Marcy’s direction. She carefully selected the projects they worked on and developed strong relationships with the homeowners. She organized the rebuild days and gave the AmeriCorps members a solid foundation in safe and healthy housing repairs and modifications to launch their work with RT affiliates they are serving around the country. Saying goodbye is never easy, especially to someone like Marcy who has been such a valued team member. We wish her all the best now and into the future! During my 6+ years at RT-AFF I met hundreds of homeowners and many of them touched me deeply, especially those in difficult circumstances who managed to maintain their grace, kindness, and resourcefulness. And the staff and volunteers! What a joy to have the opportunity to work with and get to know the dedicated people who share RT-AFF’s vision of a safe and healthy home for everyone. I take with me great memories of time spent with interesting people working on an amazing variety of projects and learning solutions to repair problems I never imagined. Thank you for the opportunity to serve with RT-AFF and our community. We’ve gathered some of our favorite pictures of Marcy at work – please take a look!